Trump, however, was wrong in this assertion. Kim & Perry, ‘Our country is full . . . . So turn around, Trump warns migrants during border roundtable, Wash. Post (April 5, 2019); Trump, Tweet (April 7, 2019). Irwin & Badger, Trump Says the U.S. Is ‘Full.’ Much of the Nation Has the Opposite Problem, N.Y. Times (April 9, 2019). This blog also frequently has discussed the U.S. need for more immigrants. See, e.g., “America’s Farmers Need Immigrants” (March 22, 2019); Businesses Need More Immigrants (March 24, 2019); U.S. Construction Industry Needs More Immigrants (April 3, 2019). Editorial, The country isn’t ‘full’—and Trump knows it, Wash. Post (April 12, 2019). This month Germany, serving as President of the United Nations Security Council, decided to open its curtains facing the East River of New York City. In so doing, Germany uncovered a forgotten piece of New York and U.N. history. The German UN mission celebrated its month-long presidency with the symbolic step of calling for the heavy drapes covering the Council’s two-story high windows to be pulled aside to let the sunshine of a New York spring day flood into the Council chamber and on to its famous horseshoe-shaped table. Here is its photograph of the undraped chamber. The curtains had not been opened since their closing after a bazooka shell had been fired from the other side of the East River at the U.N. building on December 11, 1964, but had fallen 200 yards short of the target. A subsequent investigation concluded that if the bazooka had been properly aimed, it would have penetrated the building, especially if it had struck a window. Therefore, the curtains were drawn to protect diplomats and others in the Council’s chamber from flying shards of glass. This bazooka attack happened while Cuba’s Che Guevara was addressing the U.N. General Assembly and while Cuban exiles in the U.S. were at the U.N. entrance on the west side of the building to protest the Cuban Revolution. Although the blast was heard in the General Assembly, it did not interrupt Che’s speech denouncing the U.S. A subsequent post will discuss that speech. 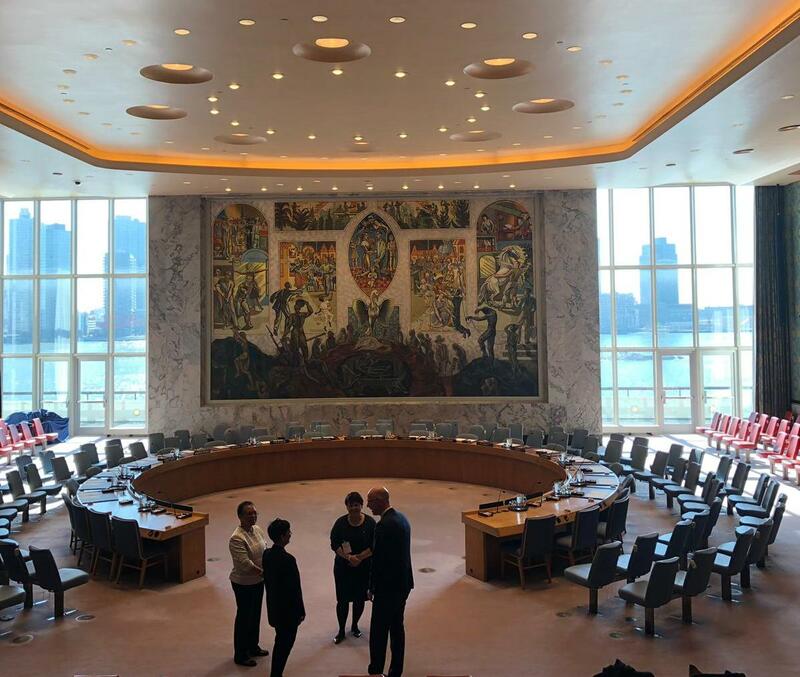 Borger, Curtains opened on UN security council for first time since attack on Che Guevara, Guardian (April 4, 2019); German Mission to UN, Twitter Account (April 3, 2019). Bazooka Fired at U.N. as Cuban Speaks; Launched in Queens, Missile Explodes in East River, N.Y. Times (December 12, 1964). One prominent spokesman of such objections was Spain’s Foreign Minister Joseph Borrell, who said his country “has told the U.S. administration that Spain is concerned about Washington’s potential decision to allow U.S. citizens to sue foreign firms doing business in Cuba.” The Spanish message included “its firm rejection, as a matter of principle, to the extraterritorial application of national sanction laws, considering it contrary to international law,” This was the Foreign Minister’s message on April 1 to U.S. Secretary of State Mike Pompeo and on April 3 to U.S. National Security Advisor John Bolton. State Dep’t, Secretary Pompeo Extends for Two Weeks Title III Suspension with an Exception (LIBERTAD Act) (April 3, 2019). State Dep’t, Remarks at the Reception to Celebrate NATO’s 70th Anniversary (April 3, 2019); State Dep’t, Briefing on the Upcoming NATO Ministerial (April 2, 2019). Reuters, Spain Rejects Possible U.S. Lawsuits Against Foreign Firms in Cuba, N.Y. Times (April 3, 2019); Guimōn, The US repeals and prolongs the suspension of a law that would toughen the embargo on Cuba, El Paīs (April 3, 2019). Gomez, Canada will defend its investments in Cuba if the United States applies title III of Helms-Burton, CubaDebate (April 4, 2019); Readout of Foreign Affairs Minister’s meeting with U.S. Secretary of State, Global Affairs Canada (April 4, 2019). Havana rejects the new partial suspension of the Helms-Burton, DiariodeCuba (April 4, 2019). Two recent posts have discussed the U.S. need for more immigrants in agriculture and business. This point was underscored by a New York Times article focusing on the need for more immigrants in the construction industry. “America’s Farms Need Immigrants,” dwkcommentaries.com (Mar. 22, 2019); Businesses Need More Immigrants, dwkcommentaries.com (Mar. 24, 2019). Porter, Short of Workers, U.S. Builders and Farmers Crave More Immigrants, N.Y. Times (April 3, 2019). On April 1 U.S. National Security Adviser John Bolton renewed his threats against Cuba. Bolton’s tweet also cited to an article by the Bloomberg agency , which through various sources stated that Cuban agents were in the presence of Venezuela’s regime. Havana will pay for ‘subverting democracy’ in Venezuela, warns John Bolton, Diario de Cuba (April 2, 2019).